Hi Beth, it's nice watching the raindrops slide down the front when I'm under a clear brolly - and of course you can see where you're going, and the tips are pointing downwards, which makes us all safer from those morons who forget they don't own the street. But I wonder, if I'm doing a lot of walking whether I'm better off with a proper full-size nylon umbrella, because the flatter shape and extra size means I'm not stepping out into the drops falling off the front edge all the time. I absolutely draw the line at cheap Reject Shop umbrellas. Hi again everybody, we don't have the legendary Marks & Spencer here in Australia but we have always had shops like it. Back when I was at high school in the late 60s-early 70s, Coles besides their supermarkets had a 'department store' in every major shopping mall or centre. These shops sold a lot of imported goods under the brand 'Embassy'. I remember it was the local Coles department store where the navy-blue nylon raincoats I wore for school came from. If I remember rightly the last one I had cost $2.99 (with two plastic rainhats in pouches thrown in for free as a 'back to school special'). They had the 'Embassy' brand, and I have a vague memory they were originally made in England. One of the two nylon coats I wear now, both second-hand but newer, has an Embassy label but was made in China. 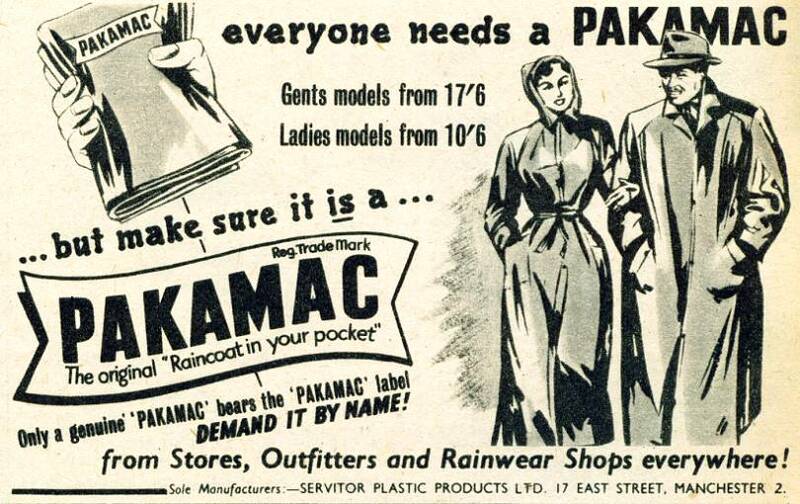 I wouldn't be surprised at all to find the coats we had then were Pakamacs in all but name. There was absolutely nothing wrong with them then (except lack of 'cool'), and as I wear them again now for outdoor activities there is nothing better. A while ago I gave my daughter a bright red nylon raincoat when I found it didn't fit me - now she wears it regularly, even to work. Believe me, if she thought it looked frumpy, or sloppy, or whatever, she would never touch it with a barge-pole. Hi G I think our worst holiday weather was in 1997 when we went to Ireland. We stayed in Killarney and I think it rained every day! The days we went to Muckross I think it was the last weekend in August were very wet and we both remember walking around the grounds in the rain. We were prepared for bad weather and I remember one of the ladies at the farm asked us whether someone had told us it rained a lot in Ireland! She also said she thought our macs were really good and as we often get nice comments I think lots of people really do like them. Despite all the rain there were quite a few people there and we had a nice time. As I said we bought our macs in Ireland and they are the semi-transparent black and clear plastic macs that were quite popular back then. I might have to add another comment about our umbrellas because I don't know so much about them but we quite like the see through ones because you can still see the gardens when it is raining outside. I am sorry it has taken a little time to write this comment but I hope it is the type of thing you wanted to hear. Please say if you would like to hear about the other days or more about the macs. Thank you for your comments. If you would like to hear more about our holidays we will try to add some comments about the rain and our macs and brollies for you. Well R&B, I for one love reading your contributions here about wet Welsh and Irish holidays in plastic macs. The place names may be unfamiliar to me but the plastic macs aren't and that's what is important. We are all here as Pakamac fans but I don't suppose anything new can be said about genuine Pakamacs. We are Pakamac lovers living the memories in the plastic macs and nylon macs left for us to enjoy in the 21st century. I imagine in a few years we'll all be consigned to history. Let's have no sniping or griping about contributors. Surely that should be the only reason to block a post. As always, my email is published here should anyone wish to chat about these garments. As has happened in the past, I will delete the email address once the spam becomes too heavy. As a reminder or for those who don't know me, I am TG. I avoid the inappropriate approaches that keep our lady contributors to themselves. The men only have themselves to blame. Hi again Rob & Beth, I meant 2013 not 2014 when we were discussing umbrellas - I mentioned that I have a couple of Fulton clear domes I use often, including one with a white outer edge and Beth had one like it. They are excellent umbrellas, I love the thick handle you can really grip, and they're bigger and nicer shape than I remember when they were first seen in the 70s. You're the absolute last posters on here that should worry about being boring. Hi G yes they are transparent black and transparent clear plastic macs and you are right we always need them when we go to wales! Although they are not very fashionable it is amazing how many people make nice comments and ask us where they can buy one. Most people are very kind but if you have a garden and it is pouring with rain you are probably just pleased to see some visitors! We are getting fed up with some of the comments on here but if you have any more questions or would like to hear more about Wales or Ireland please say and we will try to add some more. Hi Rob & Beth, the last thing you need to worry about on this forum is being boring - check how much of Frank's Pullitzer Prize winning insight has been canned. We stopped writing last time because there are so many so many negative comments here. We bought lots of plastic macs in Ireland G. Rob's are made by Go and are black and mine are mostly St.Bernard macs from Dunnes. They have kept us dry lots of times and have lasted pretty well. It is just difficult to buy anything similar now even though a lot of people say they like them. I had a cagoule G but we bought our first plastic macs to go camping in Wales in the late eighties. They were brown and blue and I think we got them from a mail order company. We started going on holiday to Ireland a few years later and we have been quite a few times since. We have often had wet weather so we have bought quite a few plastic macs! When we stayed in Killarney one year we had really bad weather so we can write about this but we will have to do this together R&B. Hi Rob yes that would be fine its macs for me umbrellas do nothing well keep the rain off will Beth write as well? Hi G, is it Gareth. I didn't want to disappoint anyone but I wasn't sure whether you wanted to hear more about our umbrellas or macs. I could write about one of our holidays when we had lots of rain and include some of the nice comments we've had from other people about our rainwear. would this be OK. It was nice to read this comment Susan because I realise that some people really want to hear about the original Pakamac raincoats like the ones in the advert here but unfortunately we don't have any and I thought this was perhaps why our comments were deleted. I love reading the comments here even when they are only slightly related to Pakamacs. It's lovely knowing that the regular contributors are Pakamac fans keeping memories and related enjoyment alive. Sorry, I meant thank you Brian. I think your advice has worked and we are really happy to contribute if it is interesting for other people. Thank you G and Robin. I thought perhaps they were deleted because they were a bit boring but you are always very positive G. I wanted to say to you and Elizabeth that unfortunately we can't remember what we posted about umbrellas in 2014 but I did find my comment from 9th October saying it was nice to read about Robin's trip to Ireland because it reminded us of our holidays there. Please say if it is the umbrellas or our pakamacs and our holidays in the rain you would like to hear more about and we will try again. Hi Rob, not sure what the problem is but your comments do not appear. I'm just seeing a blank message. Maybe it's the apostrophe character? Or double quote? Sometimes if you copy/paste from another app, the characters get corrupt and the message is blank. Try stripping any special characters and try again, or, email me your comment and I'll figure out why your messages are not appearing. Thanks. Thank you G and Elizabeth I have tried to post three comments for you but with no luck. Hi Rob, good to see you back again and all the best for the New Year. I remember noticing a while back that for a time comments various people had posted, mostly you and Beth but also Scotty, and one of my own also (which I recall no details of), were being deleted seemingly at random. These included your half of a perfectly civil discussion we were having about clear umbrellas....with my answers untouched. Those posts still appear in sequence all around Oct 2014, blank except for the poster's name and the date. At the time I put it down to just a blip in the system, and with no better information now I suppose I still do. But it did seem odd. Hello G yes we did write comments but they were deleted so we stopped. Hi Elizabeth Anne welcome back hope you will write many more comments and Rob are you the same Rob and Beth that used to write do not understand that where have you both been welcome back again any old friends please lets hear from you all. G we found the same as Steve on 27 April. Hi in Australia most of us wore nylon raincoats in high school in the 1970s, they obviously didn't come from M&S although I think they were imported from England, they were bright colors, light and comfortable, and fairly hard-wearing as I remember. I've lately started wearing them again after many years relying on the 'good' coat and the brolly. HI Janice my first wife had one only mac she ever liked. Susan the MS macs also had unique buttons I could always tell buy the buttons it was a MS mac I think other macs had there own as well. I don't remember those nylon macs at all Janice. It's probably because I didn't start shopping there until the 1990s. I always bought Rainstar nylon macs from John Lewis. There was a branch of Fenwick's that I visited frequently. They sold traditional nylon macs with an extremely feminine style of button that was quite unique. Frank your funny indeed!Is Jane not from the moon..Think its a raincoat day today!